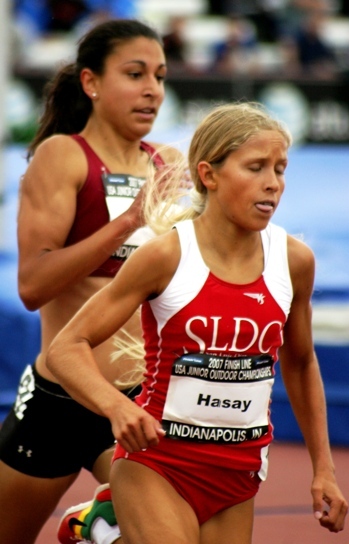 The adrenaline rush, if you’re a deepened fan of prep girls distance running, especially if you count yourself as a Jordan Hasay fan, was incredible during the final lap of the recent USATF Junior 1500. Against at least three girls with superior PRs to hers, with supposedly superior speed, Jordan had launched a long, strong kick with 300 to go. Behind Hasay, defending champ Danielle Tauro broke away from collegians Jessica Pixler and Nichole Jones and gave chase. Wouldn’t Tauro, with her closing kick, or even Pixler and Jones, with their better 1500 and 800 times, come back and catch her? Jordan doesn’t have that kind of kick, does she? She can’t win a race against the very best milers, can she? There sometimes is a moment in a race, even before the finish line is crossed or the final time flashes on the scoreboard, when you feel the full magic of a spectacular performance. At that point, you know the result is going to be special, that the point of no return has been reached, and that the final meters are just going to be gravy. So it was, with 200 to go, with 150 to go, and into the homestretch, Jordan kept expanding her lead. That “adrenaline” maxed out. They’re not going to catch her! They’re not going to catch her! Because you’re supposed to be a “detached” journalist, and you also appreciate the competition, you try and avoid jumping up and down and pumping your fist in the air. You already know it’s an all-timer, and the scoreboard clock confirms it – 4:16.98! In the latter meet, Jordan won the mile by a huge margin, and for the second year in a row. But for a girl with her eye almost always on the clock, and with that 4:39.13 1600 PR, her GWI winning time of 4:43.34 was wholly unsatisfying. 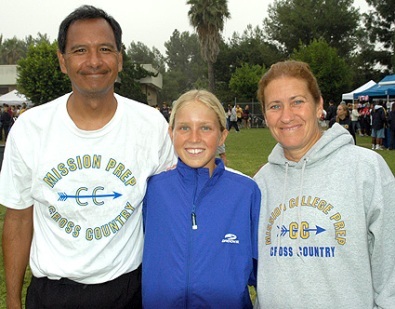 “She said, ‘I don’t know if I can go any faster,’” recalled Coach Siqueiros. But to understand the gravity of this issue, you have to understand how the whole year has gone for Jordan. So you go back to the fall. What a tough year of ups and downs. With the long term plan of the World Junior XC Trials in mind last fall, with a later peak, Jordan’s training was modified and the result was a lack of improvement on many of the courses she raced. “It was really challenging, not running as fast on courses as I did my freshman year,” she said. She was still unbeaten going into San Diego, but she was no longer the heavy favorite, after the results Kathy Kroeger and Aurora Scott posted in the South. Still, no one could have imagined what happened. At the early February World Trials in Colorado, however, the long-term plan paid dividends. Jordan was as dominant as she’d ever been, destroying a good field, which included FL runner-up Aurora Scott. It was the Jordan of 2005-06, in full force, and the excitement built for her trip to Kenya. “That restored her confidence and trust, and that’s the biggest thing I need to maintain,” said Coach Siqueiros. The soph’s better-than-ever fitness level was revealed days before the trials when, unable to find a race, Siqueiros put his charge through a 3200 time trial. She hammered out a remarkable 10:02, going 5:01-5:01. It told them she was ready to burn. But fate would deal Hasay another bad card. The threat of terrorism in Kenya reared its ugly head, besieging runners already stressed by the challenges of Visas, immunizations, etc. It was a long, difficult decision, but the Hasay family – Jordan’s parents are Joe and Teresa – finally decided not to go, joining scores of other American team members. Jordan’s fitness-level was there, though, and coach and athlete had decided to make the most of it. She launched an assault on 10:00 in two races, but hit a ceiling at 10:04. But then she surprised herself with that 4:39 1600 on March 31, clipping her PR and setting a National Federation record. Next on the calendar was Arcadia. The hype for a sub-10 was building to a pitch. A special clock was going to be set up for Jordan to run past, beyond the 3200 finish, to get a 2-mile clocking. The pressure got to her. Coach and athlete had planned on a rest after the Kenyan meet, but after the trip was abandoned, they extended the racing beyond what it would have been. But there was the chance to race Kosinski three weeks after Arcadia, so they did that. Not only did the Oak Ridge sr. dominate the race, 4:38.15-4:43.85, but Jordan lost a 3200 later in the meet to Laurynne Chetelat, 10:23.31-10:32.30. Finally, they took a break – two weeks of easy running. Still, Coach Siqueiros tried to build optimism going into USATF. Here, Jordan could finally “race” instead of time-trialing against the clock. Here, it wouldn’t be one-on-one with pressure against someone like Alex K., and in a state of needing a break, but with a pack of prep and college runners and at near-peak form. The attention was more on the men’s 1500 here, and what attention was on the women’s was mainly on Tauro and how she would do against excellent freshmen runners Pixler and Jones. 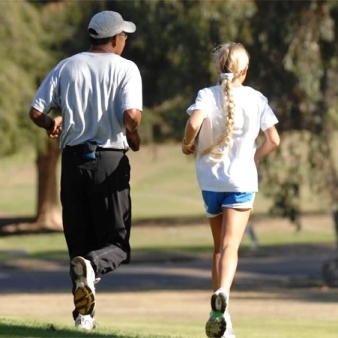 Coach was also getting a lot of flak about Jordan’s supposed lack of speed, her stride pattern, from all corners. But he stuck to his guns, believing that the speed had improved during the season and it would be made evident with rest and peaking. So Jordan ran with the pack, and patiently. She tagged along as Jones pushed the early pace. Tauro and Pixler also went right with Jones, and they pushed through solid splits of 68.7 and 2:18.3. Jordan’s plan was to move with 700 to go, though Coach had encouraged her to consider holding back if they pace was much faster than 2:20. It was a bit faster, but she tried to go anyway. That type of move hadn’t worked for her against Tauro last spring at NON. So maybe it was a blessing in disguise that she could get around them. But Jordan’s attempt somehow served to get everyone pushing and the third lap was 66.9, giving them a 3:25.2 1200. It was almost red-line territory for the preps. Except … that was where Jordan made her move. At first, there was a slight feeling of disbelief, then a feeling that she would probably get passed back. Then … then that dawning realization that NO, she was not going to get passed and this was suddenly going to be a great victory for her in a great time. “I was going in with the idea of just having a good experience, not worrying about things, so this was a great surprise,” Jordan said. “The whole race played out just perfectly. It was fun for me to run in a pack. I was patient and stayed relaxed, and in lane one early. Unfortunately, the finishing straight also featured a collapse by Tauro, as she tried to hold a reasonable margin behind Hasay. She regained her feet after deadened legs caused her to step on the rail and fall, and she crossed the line just over 4:30. Tauro was on her way to her best race of the year, even if she had been beaten. But in the medical tent afterward, she allowed that the incident had felt very similar to Foot Locker Northeast last fall, where Rhabdomyolysis had struck her down and ended her season. Jordan’s 1500 time, however, converts to a 4:37.53 mile, 1.72 faster than Tauro has ever run, and the 4:16.98 was more than four seconds beyond the defending champ’s 2006 time. Danielle would have needed a significant PR to have won today. It’s a situation where you have to acknowledge the abilities, courageous effort, and unfortunate circumstances for one champ, and the great, breakthrough performance by another. In effect, this was more than a 3-second PR for Jordan and hiked her up to #4 all-time on the 1500 list. Lest one think that list is inferior to the mile, she would have risen to 5th with the conversion. She set a national sophomore record and, more impressively, got an Olympic Trials ‘B’ qualifier for next year, which she is perhaps most excited about. Best of all was how coach and athlete got to this place. Jordan did nothing special in training those last two weeks between Golden West and USATF. She backed off somewhat to a peak, and let the work she had done work for her. But Jordan HAD gotten faster during the spring, breaking 30 for the first time in the 200 (28+) and running a few 61 legs on the Mission Prep 4x400. Coupled with her already formidable endurance and stamina, it was just a matter of the right race at the right time for another breakout. Challengers be weary, the best Jordan is still yet to come. Now Jordan prepares for the World Youth Games. She expects to just do the 1500, but there’s a chance she will double. The World Youth team will appear at the USATF Youth Nationals this week and weekend to test their fitness. The 1500 world list reveals that not only is Jordan’s 1500 #3 in the world, but both Ethiopian girls ahead of her were born in 1990. Jordan is the fastest in the world born in 1991 or later. Think about that.